Opal triplets combine natural opal with layers of other materials. A thin slice of natural opal is assembled between a base (usually of matrix, plastic, glass or other material) and a colorless top that protects the natural opal. On occasion, the bonding agent may account for the third layer. Opal triplets typically provide a more affordable alternative to natural, solid opal. The cap of the triplet can be made of colorless synthetic spinel, rock crystal quartz or glass. The RI of cap will help you distinguish the make up of the stone. The base of the stone can be made of potch opal, dyed black chalcedony, glass or other matrix materials. In opal triplets look for assembled nature and glue layer. Look for straight separation planes to distinguish opal triplets from natural opal that contain a potch opal under layer. Stones might have areas of potch or matrix that lack play-of-color. 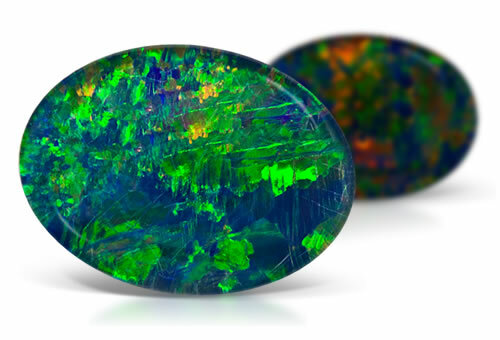 Synthetic opal will have a more uniform play-of-color appearance. The base of the stones are sometimes glued using black cement to give the appearance of a black opal.